2. a specific surface of a body structure, part, or organ. 3. the expression or appearance of the face. adenoid facies the dull expression with open mouth, in children with hypertrophy of the pharyngeal tonsils (adenoids). facies hepa´tica a thin face with sunken eyeballs, sallow complexion, and yellow conjunctivae, characteristic of certain chronic liver disorders. facies hippocra´tica a drawn, pinched, and livid appearance indicative of approaching death. leonine facies a peculiar, deeply furrowed, lionlike appearance of the face seen in certain cases of advanced lepromatous leprosy and in other diseases associated with facial edema. 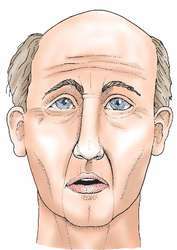 Parkinson's facies (parkinsonian facies) a stolid masklike expression of the face, with infrequent blinking, which is pathognomonic of parkinson's disease. a masklike and immobile facial expression, usually occurring with Parkinson's disease. Infrequent blinking also occurs. Also called masked facies. A masklike facies with infrequent eye blinking and decreased facial expressiveness.